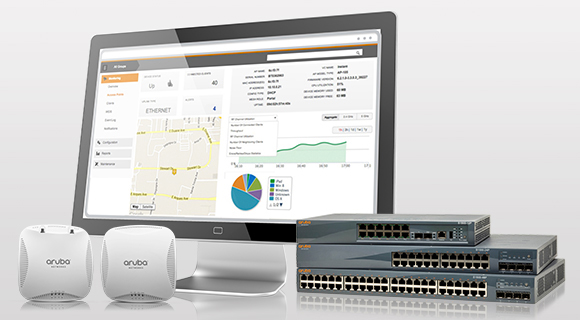 Aruba Networks is a leading provider of next-generation network access solutions for the mobile enterprise. The company designs and delivers Mobility-Defined Networks that empower IT departments and GenMobile, a new generation of tech-savvy users who rely on their mobile devices for every aspect of work and personal communication. To create a mobility experience that GenMobile and IT can rely upon, Aruba Mobility-Defined Networks™ automate infrastructure-wide performance optimization and trigger security actions that used to require manual IT intervention. The results are dramatically improved productivity and lower operational costs. Aruba Mobility-Defined Networks empower a new generation of users who rely on their mobile devices for every aspect of work and personal communication. To create an enterprise mobility experience that GenMobile and IT can rely on and trust, Aruba Mobility-Defined Networks automate infrastructure-wide performance optimization and trigger security actions that used to require manual IT intervention. Mobility-Defined Networks control the dynamic enterprise mobility environment by correlating real-time data about users, devices, apps and location. Self-healing and self-optimization functions dramatically reduce helpdesk tickets and protect enterprise data. Aruba employs a software approach that extends enterprise mobility intelligence across wired and wireless networks all the way to users, devices and apps. This makes Aruba Mobility-Defined Networks amazingly easy to deploy without any changes to the existing infrastructure. Aruba 802.11ac Wave 2 wireless access points deliver superb Wi-Fi performance – they can be deployed as controller-managed or controllerless Aruba Instant APs depending on the design, scope and scale of your wireless network. ClearPass solves today’s digital workplace security challenges across any multivendor wired or wireless network by replacing outdated legacy AAA with context-aware policies. It delivers visibility, policy control and workflow automation in one cohesive solution. Built-in WAN services like compression, policy-based routing and survivability health checks improve application performance, ensure continuity of services, and eliminate business disruptions in the branch. Built-in security with integrated firewall and secure VPN provide strong protection while ensuring regulatory and corporate compliance. Built-in threat management with content and URL filtering secure branch network traffic and simplify guestInternet access. Cyber security has become a real challenge that many solutions cannot survive. So what now? 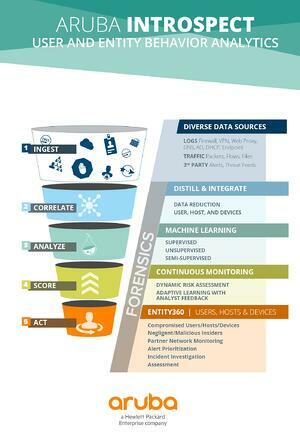 User & Entity Behavior Analytics (UEBA) is one of THE innovations in the fight against cyber criminals. To detect changes in the user behavior - which often indicate an internal attack - the user and entity behavior analytics (UEBA) by Aruba relys on AI-based machine learning. Security teams see behind the curtain of malicious, insecure or negligent users, systems and devices and can nip the threat in the bud before they do damage. Download now the free Whitepaper "The CISO's guide to Machine Learning & User and Entity Behavior Analytics" by Aruba and learn more about how UEBA works and how IntroSpect can also increase your Cyber Defence. The business value of network security - Download now the free whitepaper provided by Aruba. Why Aruba Networks by InfoGuard? Extensive experience in networking - from architecture and design as well as implementation and operation. Long-term cooperation with Aruba and a broad customer base. InfoGuard has highly qualified Aruba Engineers. We provide you an Aruba whitepaper on "The business benefits of protecting and authenticating users of wireless and wired network security" for free. Download now!